May brings a great deal of inspiration with all the restored beauty of the earth as the new growth of spring is in full effect. The phoenix rising from the ashes always brings in new high and vital energy for creativity, romance and passion. 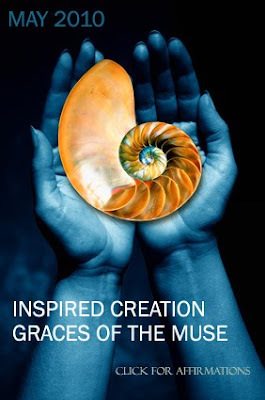 This month we will explore the power of the Muse, finding this creature within and tapping into the grace that flows into our life as a result of appreciating the beauty that wants expression. See below the affirmations for the month of May to help you Find Your Muse! I have a passion to create. I am a conscious co-creator of my life. I walk in beauty always and in all ways. There is a force within me to be reckoned with. I am dreaming a life of love, grace and beauty. My creativity is inspired and inspiring. Inspiration comes to me easily. I am a channel for the magic within me. I express myself from my truest essence. I am filled with ideas and guided to take action on them. I organize a beautiful space to create my dreams. I imagine beauty every day. I clear my mind with meditation, silence and calm reflection. I awaken to my passion. I allow my soul to seek expression. What I love will help and heal others. I connect to the artist within. My emotions are expressions of my soul. My imagination is the gateway to other realms. My dreams guide me along the path of realization. I am awakening to my special genius. I source the courage to express my authentic self. I bless the waters of my body and the earth. I allow creativity to flow through me. I am filled with purpose and passion. My life is a masterpiece. Dan Buettner teamed up with National Geographic and the National Institute on Aging to research the world’s blue zones. Blue Zone’s are geographical pockets across the world that have an inordinately higher instance per capita of people who have significantly increased lifespans. – namely living to be 100+ years or more. You can free yourself from aging by reinterpreting your body and by grasping the link between belief and biology. The way you think, the way you behave, the way you eat, can influence your life by 30 to 50 years. The less you open your heart to others, the more your heart suffers. If you and I are having a single thought of violence or hatred against anyone in the world at this moment, we are contributing to the wounding of the world. The physical world, including our bodies, is a response of the observer. We create our bodies as we create the experience of our world. We are not victims of aging, sickness and death. These are part of the scenery, not the seer, who is immune to any form of change. This seer is the spirit, the expression of eternal being. 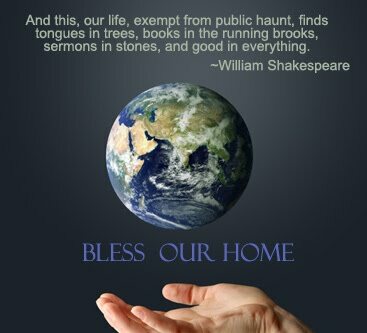 During the month of April we will be blessing our home: Mother Earth. As going green, eco-spirituality, ecology and environmentalism become burning concerns of the times it is so important to remember that WE ARE NOT SEPARATE FROM THE EARTH. What we do to the earth, we do to ourselves. But perhaps we should take a closer look at that. What comes first, the chicken or the egg? Do we disrespect ourselves and then dishonor the environment? Do we feel that we are not a part of nature, that we are interlopers? This is the very attitude that fosters the disconnect. We seem all too happy to speak of ourselves harshly and get down on the way we treat the earth. Not remembering that every unkind thought we cast against the human race will find its way into the soil and the water of the land. For we are not separate. And until we start to treat ourselves better, and not just on a surface level, but at the level of really feeding the core of our own soul the battle to heal the environment will continue. Once we feel that deep, deep connection to the earth, to the elements that we are made of, to the animals and land that are the outer manifestations of our own inner landscape, we will know peace on earth and oneness in our hearts. I am an earth-walking being of Light. I take care of the earth and as I take care of my body. The earth is my kingdom. I connect to nature, animals, trees and the ocean with reverence and awe. I walk the beach and am healed by the sunset. Each day the sunrise brings me a new beginning. The earth is filled with abundance. I see the interconnectivity of all that is. Birds remind me to seek the freedom of my soul and let my spirit soar. Trees remind me to think the thoughts that lead me to the Light. The waters of the ocean restore and heal my soul. Fire ignites passion within and transmutes fear and pain. Turtle reminds me to slow down, be still and go within when need be. The mountains lift me to the highest reaches of my soul. The green of the leaves and the blue of the sea calm and nurture me. I am grateful for this beautiful planet, the solar system, the sun, moon and stars. I send love to any part of the earth and her inhabitants that need healing. If I am a reflection of God, then human is divine. The earth and I are one. The animals, the landscape are part of my outer and inner world. The sun embodies the life-giving light of the world. The moon calls the still waters of looking within. I am a good steward of the earth.